A robot doesn't have to big, powerful and terrifying to be worthwhile, and many people are working on miniature machines that are just as cool. Some of these endeavors show promise in medicine, but there are plenty of potential uses for microbots, especially when you can persuade a swarm of them to work together. Research outfit SRI reckons tiny automatons have a bright future in manufacturing, thanks to its new method for precisely controlling individuals within a larger group. You see, one of the best ways of propelling and controlling microbots is by using magnets. and it's because there's no need for an on-board power source that we can make 'em so small. This poses a problem, however, as a pack of bots will all respond to a magnetic field in the same way, making it hard to give anything but a blanket order. 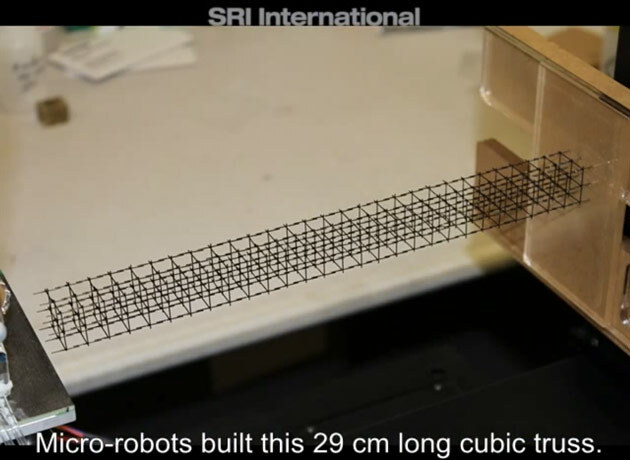 What SRI's done though, is to create special surfaces for the microbots using printed circuit boards that let you control magnetism at a very local level. In this way, several of the things can get on with completely different tasks in close proximity to one another. And, to demonstrate how precisely microbots can be controlled with this technology, SRI's had them building small structures in the lab. The thinking is that such technology could be used for creating "micro-factories" that manufacture electronics and the like, but SRI's also interested in seeing what other applications researchers can come up with. In which case, we can look forward to more awesome clips of the microbots in action, just like the one below.